That makes two. Pownce, the original competitor to Twitter, has just been obtained by blog platform company SixApart. This, on top of I Want Sandy and its company Values of n being purchased by Twitter just last week. On the surface, they have little in common other than the loose micro-blogging components that they share. One’s a Twitter-like system purchased by a blog company, and the other is a contextual assistant with powerful tagging, obtained by Twitter itself. There has, however, been somewhat of a backlash on how the closings of these technology communities have both been handled. Users of I Want Sandy bemoaned the idea of finding a replacement that could come close to what it does (and actually started a chain on their community boards suggesting comparable alternatives). And while there’s just a small, devoted group of people on Pownce, its members are wondering why the service would be shut down after being obtained – and in need of clarification on why it had been obtained in the first place. Both were purchased because they have a useful core technology that can be semi-applicable. Right now, as I Want Sandy and Pownce exist, they serve only a minor usefulness to the companies that purchased them. But with some re-application, both of these technologies could be game-changing enhancements to both Twitter and SixApart. Or – another one – Pownce could be implemented as a way to create a more social blog that competes with Twitter – perhaps as a way to make comments more real-time. I’d argue that the lack of real-time communication and the inability for users to conveniently aggregate and respond to blogs comments is one of the reasons why conversations are now moving to Twitter. So, by re-purposing Pownce’s core, SixApart might be able to move conversation back to blogs in order to stay relevant as personal online communication evolves. The point is that there’s an inherent value in purchasing these technologies and folding their developers and information architects into these pre-existing companies to enhance their products. Right now, all of the old communities see are their technologies – and their communities – being shut down, with nothing to show for it. It’s these people who should see their beloved ex-platforms turn into something great. At the very least, explanations – and possibilities – should be shared with them. But I’d argue that it should be these very people who are included in the process of transition. If you were the purchasing company, wouldn’t you like to have a loyal base at your disposal – who would become dedicated members of your own service as well? Wouldn’t you want to keep them as users to help perfect the implementation of their technology in Beta testing? I suppose it’s something to keep in mind: how we handle online communities after we help grow them is just as important and as valuble as how we handle them as we build and maintain them. Very interesting article from the New York Times today about the subject of “cyberchondria.” That’s when you research medical symptoms on the Internet, and 20 minutes later you start to think that you’ve got a terminal disease. It’s one of those “duh” studies, but the intention for the research is to create a better system for searching medical information, and so the basic premise of “cyberchondria” needed to be researched first. On Monday, Microsoft researchers published the results of a study of health-related Web searches on popular search engines as well as a survey of the company’s employees. The study suggests that self-diagnosis by search engine frequently leads Web searchers to conclude the worst about what ails them. The researchers said they had undertaken the study as part of an effort to add features to Microsoft’s search service that could make it more of an adviser and less of a blind information retrieval tool. The funny thing is that my own doctor advises her patients to look up additional medical information up online. I’ll share this story: one time, she wrote down my ailment, passed me the piece of paper, and told me to “Google it.” I looked at her as if to say, “hey, aren’t you the doctor?,” and it really surprised me that medical professionals would be giving that kind of advice. I assume it’s because of a need to cut down time with patients, but that’s a tad on the negligent side. By the way, I’m in the process of finding a new doctor. Here’s to hoping that the study yields some positives for medical “Googling.” Cyberchondria is real (I’ve had it from time to time, and I’m a pretty logical person), and if more doctors are following my own doctor’s trend of telling patients to “Google it,” then we’ve got real problems. Today, my personal assistant went and quit on me. It was a pretty good deal for me. I’d send her e-mails and tweets with events and to-dos. She’d send daily agendas, would remind me of things via tweets, text messages and e-mail, and I never forgot a thing. She made me more proactive and task-oriented. And best of all, she was unpaid. Today, on a community support board, Rael Dornfest of Values of n announced that his company had been aquired by Twitter. As a consequence, IWantSandy (my assistant) and another contextual service called Stikkit will cease to exist as of December 8th. It’s been mentioned that eventually some of the technology might be implemented into Twitter. I actually don’t see how a task management program might be naturally related to Twitter, with Twitter being one of my biggest (and worthy) timesucks. So, Sandy’s gone. There’s nothing quite like her – she understood context, so you’d just type things out, including when and where she should remind you. I’m trying a few other services, but…nothing similar. Life’s just not fair…(I kid..I’ll find something…). She gave her proper 2-weeks notice, but many in the IWantSandy community are outraged. It seems as though we have a tendency to expect free services to last forever, which is impossible. At the same time, I see their point. As we begin to outsource our brains to “bots” that have names (and Evernote could be catching on), we become ever-increasingly dependent. When someone pulls that plug on something that we believe to be “ours” – and in this case, it’s a “personal assistant” with our data, who “works” for us – it seems natural that we’d be a tad pissy. For me, it’s a task management system that worked well for me, and I actually enjoyed using it. Mainly, I’m sad to see Sandy go. I’m recooperating after a little bit of election addiction. It was pretty bad for a little while, but now, with no more polls to check, I’ve been working to fill the lull. So far, it’s been filled with walks in parks (ah, air) and catching up on some needed sleep (I’ve been passing out at 9 PMish since Election Day). Unfortunately, I’m still doing the MSNBC watching, but c’mon, Rachel Maddow’s show is the best, and it’s an exciting time. With my mind liberated from the nightmarish horror that was the concept of a Sarah Palin presidency, who knows what might happen. Last night, I sold my iPhone on eBay. Why? Because the new 3G iPhone comes out on Friday. Not that it’s got features that are much different than my current one. Really, it’s just 3G (which is actually great for me and I’ll love this), has GPS and has a bigger hard drive if you choose the top model. I did it, mainly, because an eBay search showed me that original iPhones, as of yesterday, were still going for $350+. Now, the new iPhones will cost $200 and $300 for the lower and top models. So what did I do? I put mine up, and lo and behold, someone actually bought it for $345. Free iPhone upgrade, here I come. This past weekend, the New York Times published a series called “What Went Wrong?”, which is trying to do a bit of a post-mortem on the Clinton campaign and explain, as the title suggests, what went wrong (note how the focus isn’t on what went “right” with the Obama campaign, which is actually a better question). “From more aggressively courting young people earlier to mobilizing the full power of women, there are things that could have been done differently. It was the entire Obama narrative — the concept of unity and creating a movement — that drove people to action, and to donate. Think of key phrases from the campaign, from the “Yes We Can” slogan to lines like “we are the change that we’ve been waiting for.” The phrasing of words are specifically designed to target activation. Look at, for example, the words above the e-mail signup, and compare the phrase against the competition. What’s more likely to induce action? “Get Involved,” or “Get E-mail from Hillary”? Language that urges inclusion and the concept of literally “buying into” the campaign — almost like an investment — is what activated donations from contributors. Flipping a slogan from “Yes We Can” to “Yes She Will” doesn’t give people the same kind of buy-in that a “we” message can. A truly action-inducing campaign’s message needs to be more than just a collection of dial-tested phrases and slogans. Sure, polling helps to refine your messages, but there’s the notion that all of these dial-tested phrases need to end up coming together as a solid, inter-woven narrative that is designed to use the concept of “inclusion” to motivate supporters towards action. That’s not to say that the Clinton campaign didn’t have emotionally-invested supporters (and we know that she did, and we’re clearly seeing it now). However, when Penn talks about message and Obama’s “money” as separate, non-complementary concepts, I scratch my head a bit and wonder, because it was the message that allowed for supporter-based small donations to flow in. Seems like I’m not the only one who dreads opening up his RSS reader these days (hat tip: Download Squad). Here’s an interesting experiment: one blogger, Halsted (AKA Cygnoir) has sworn off her RSS reader for an entire week, choosing instead to read blogs the “old-fashioned” way: actually going to the blogs she wants to read at that moment and reading the posts there. “As I mentioned in my last post, I’m a bit overwhelmed by information right now. In a fit of pique (which just the other day I learned, thanks to FunkyPlaid, is monosyllabic) I decided to stop reading all RSS feeds for a week. Yesterday was “Day 7.” How’d she do? In an age where we’re slaves to the philosophy of “must not miss a single thing,” what kind of consequences are we imposing upon ourselves? Sounds like we all need a little “web zen” these days. Sure enough, a few moments later, I received a tweet asking me if I’m experiencing technical problems. As of right now, no, I’m not. But the word “Comcast” leaves a sour taste in my mouth. It’s not anything that can be solved tech-wise. They’re systematic changes, like updating the on-screen menu for the first time in 10 years, fixing their auto-bill-pay system that it doesn’t take weeks to cancel (so when you cancel your account, you still get billed and have to wait for a refund check), or them telling me that I have to go and exchange boxes, in-store, if my cable box is nuked. 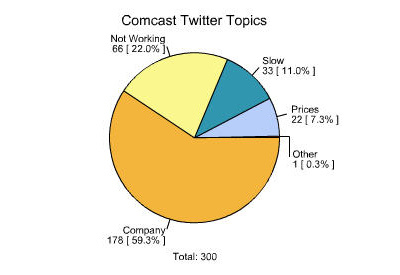 Under the current Twitter system, how can Comcast solve these concerns? It’s a nice effort if they’re trying to solve tech problems, but that’s not what’s the “problem” is that we have with Comcast. Instead, the Twitter initiative will likely evolve into a “why I hate Comcast” free-for-all, and we’re going to overwhelm the poor Comcast rep with our complaints. What Comcast is doing with Twitter might be a good first step, but like David All warns, they have to live up to their promises in helping us solve said tech problems. The problem is, of course, how a representative in Philly can ensure that everyone who needs help gets real help. He’ll be overwhelmed, and he’ll be lost in the technical argument of “hey, this still doesn’t work.” And if things still don’t work, negative will will form. There’s no winning, because the only good thing that can happen out of this model is resolving a negative issue that a customer has with a service that they’re already paying for, and that they expect to work optimally. The model is not about improving experience. Instead, Comcast needs to use Twitter as a means to solicit real opinions about Comcast to promote systematic change. That’s the only way they can “win” here, and really solve the problem that people have with Comcast. And if they’re not up for that, then this might not be the right experiment for them to take on. Would you believe it, there’s a new study out (hat tip to TechDirt) that did some research on online influences. Turns out that our entire social media profession is useless, says the study, because “self-described social media users put far more trust in friends and family online than in popular bloggers, or strangers with 10,000 MySpace ‘friends. '” So much for our profession, right, social media people? Yeah…no, it really doesn’t mean that, because you just conducted a stupid study. How did the study operationalize “popularity,” “credibility” and “influence”? They didn’t. They just asked people, “hey, do you listen to blogs more, or your friends?” and then published the results as if they were valid. What did the study group consider as a “blog”? Were they thinking about the most popular blogs, like DailyKos, Huffington Post, and so on? These are blogs where there’s not much interaction between a blogger and the audience. They’re popular — but how do we define credibility and influence based on their popularity? They’re extremely distinct and different concepts, and completely mutually exclusive. The loudest person may be heard, but they don’t have to have the most influence. What about blogs like DownloadSquad or Lifehacker? These are blogs that “recommend” things. Therefore, they have more influence. I read these blogs to learn about the “latest and greatest,” and influence what I download and purchase. Or what about sites like HeatEatReview, that tells me what frozen foods are delicious and what I should stay away from? Or CoolMomPicks, that acts as a pretty spectacular guide for moms? Another variable: what if I consider the blogger my friend? I’ve met plenty of people through blogs that I’d consider my friends, but I’ve never met them in person. So, are they a blogger, or are they my friend? Because I listen to those people. If they say, “oh man, you’ve gotta check this out” or “I love this product,” I’m bound to listen. “Blogger” and “friend” aren’t mutually exclusive, either. And, really, what is this study? Who doesn’t trust something more than their “friends?” I trust my friends’ musical recommendations more than I trust the Rolling Stone reviews, so should Rolling Stone shut down? If my friend says, “hey, you’ve gotta try this new cleaning product,” but Consumer Reports says it’s useless, and I trust my friend, should Consumer Reports just cease publication? Really, I wouldn’t even call this a study. I’d call it a question. Study implies that you actually use research methodology. So, my take? Ignore this thing. Please. UPDATE: It’s been pointed out to me by my friend (girlfriend, to be exact) that you shouldn’t trust my opinion on this. I’m just a blogger, you know. Alright! Just when you thought my “social media and anthropology” series was more of a vapor-series than a real one, I’m back with part two! In the first post, I was beginning to discuss the role of culture in new/social media, and how we can use anthropology and culture studies in order to produce better and more resonant media campaigns. Why is this? When applied to communication, research and knowledge of the target community helps communicators create more compelling strategies, solutions, and messages. You need to learn how a group shapes its perceptions — and of course, how it expresses itself. Otherwise, you risk striking a culturally off-key note. After all, great communications always connect and strike a chord with people. To me, the main ingredient in a real campaign is a compassion and empathy for my audience. Think about Bill Clinton’s famous “I feel your pain” appeal. Why did it connect with people? Because a great communicator understands that the relationship between what he or she has to say and how it connects with others. But say you need to appeal to an online community that you don’t really know all that well. Or say you know about the subject that the bloggers talk about (say healthcare or politics or economics), but you know nothing about the actual online community. What are you to do when you don’t know the “pain” that a group itself faces? How can you understand, in-depth, how to appeal to a community? Or how to even navigate it or get started? How? In anthropology, the ethnography itself is an account of a specific social system. Included are generally a breakdown of roles, norms, values, motivations, symbols, and other social breakdowns. The ethnography focuses on detailed observations of what the culture “actually does” — its social behavior, and reasons and motivations behind them. It’s also extremely systematic, and insights come from a rigorous analysis of systematically collected data (cough, metrics, cough). The best ethnographies are quite objective. It’s also not just observation that gets the job done. Ethnography is also based — and this is key — on a participatory model (are bells ringing in your head, my social media friends?). Ethnographers take part in cultural events. Participation lets the research “feel” what it’s like to be a part of the group being studied. Participation works not only as a means of gaining insight, but trust. Don’t forget — the social scientist (the “participant”) is also being observed and evaluated as the ethnography is conducted, so participation builds rapport. The observer-participant model, together, lets social scientists — and in the case that I’m trying to make, us social media people — better able to understand and widen our perspectives on the culture we’re interacting with. Because of it, we have better analytic insight and a deeper understanding of the culture and what makes it tick. Once we have that, we can build better campaigns. In my next post, I’m going to lay out the ethnographic model and map out the “social media equivalent” to these. I’ll be going from the conceptual, theory-based stuff to the practical “this is how you do an ethnography with an online community.” And no, don’t worry, it’s already mostly typed out, so expect it soon!